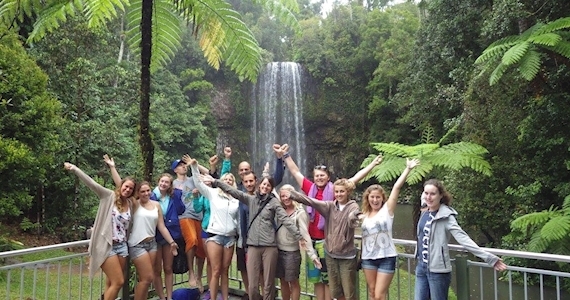 This popular nature tour takes us to the highlights of the cool tropical Atherton Tablelands. Departs Cairns daily at 8:00am. Rainforest Waterfalls: The day begins with a visit to the Curtain Fig Tree and continues with guided rainforest walks in search of native wildlife at both the Cathedral Fig Tree and the volcanic crater, Lake Barrine, before lunch. Travel through the picturesque countryside for the day’s highlights, swimming at several pristine waterfalls, such as the famous Millaa Millaa, plus a jungle trek to view the raging Dinner Falls and World Heritage listed Mount Hypipamee National Park. Mountain Bikes, Wildlife Canoeing: Guests are treated to a guided mountain bike ride through the lush, green Atherton Tablelands countryside and rainforest for a swim and walk at the volcanic crater, Lake Eacham. (lunch can be purchased here at own expense). In the afternoon we explore a secluded area of Lake Tinaroo in the safety of our two person canoes. Our guide will help you spot rare wildlife such as tree kangaroos, birds and water dragons. Then, have your face painted with Aboriginal ochre clay before hot showers, tea and coffee at ON THE WALLABY LODGE. The tour returns to Cairns at approximately 7:00pm.